I would have probably had some more trouble doing this one.. But then about a week and a half ago, my brother told me that Troy from Community (played by the excellent Donald Glover) had a rap album about to be released and that is has been doing it for awhile, etc..
Of course I had to scope some of the songs. There are 2 that I absolutely love.. And the rest are also pretty great. He is nerdish (seriously, some of the lyrics are just.. nerdishly awesome!) and explicit and just excellent. Anyways. 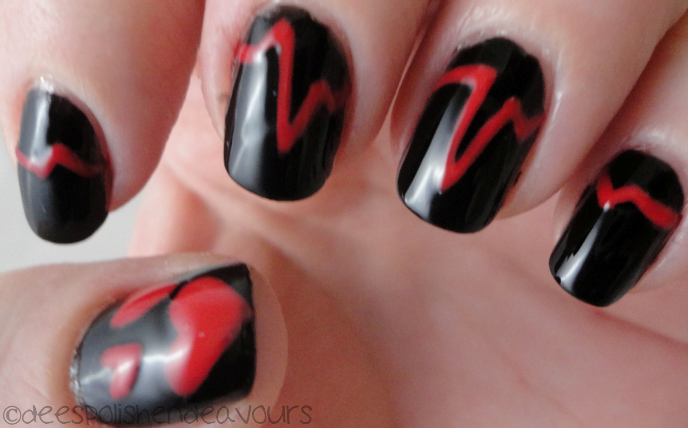 I decided to use the song 'Heartbeat' as my song choice because it fits this heart monitor mani I have seen before that I really wanted to do on myself.. Did and done! I used Orly Liquid Vinyl and Essie Silken Cord. I decided to skip the lines on my thumb as I tried to see how I could align my thumb with the rest of my fingers for photos and yeah, wasn't happening.. So sad little hearts is what you get via the thumb! I have been trying to take some photos without the thumb involved.. But it feels weird to me. I think I will always have to be a thumb-in-photo-includer. Yah. AND I love his whole album and now I am slowly collecting some of his "older" tunes as well. Love. Him. @Rainbowify Me - Thank you, I thought it would be kind of fun to do.. Simple and effective!